The success of an information system depends mainly on its ability to properly support interaction between users and information. Current information systems, however, show as a particular point of failure the vagueness between user search terms and the knowledge orders of the information space in question. Studies in interactive information seeking behavior have confirmed that the ability to browse an information space and observe similarities and dissimilarities between information objects is crucial for accidental encountering and the creative use of information. This is in particular true for heterogeneous information spaces within the open web. Some kind of guided searching therefore becomes more and more important in order to precisely discover information without knowing the right search terms. Knowledge mapping encompasses all attempts to use visualizations to gain insights into the structure and evolution of large-scale information spaces. Knowledge maps can take the form of network visualizations, heat maps, tree maps or specific, map like arrangements of search results. However, most maps are static visualizations made for special purposes, and usually neither interactive nor dynamic. Moreover, not much of the experiences made in knowledge mapping have ever been implemented in online interfaces to digital libraries and collections, nor is there a stable and continuous knowledge exchange between the “map makers” on the one hand and the Information Retrieval (IR) specialists on the other hand. 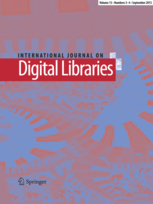 Thus, knowledge maps of digital library collections are promising navigation tools through knowledge spaces but still far away from being applicable for searching – due to a lack of models that properly combine insights of the two strands. The focused issue therefore aims at bringing together these two communities in order to discuss the potential of interactive knowledge maps for information seeking purposes and to create a common ground for experiments aiming at the incorporation of knowledge maps into IR models at the level of the user interface. Therefore, the leading research questions for this special issue are twofold: How can knowledge maps be utilized for information seeking in large information spaces? And, the other way around: Can insights from IR also improve knowledge mapping itself? – Evaluation of interactive IR systems. Papers submitted to this special issue for possible publication must be original and must not be under consideration for publication in any other journal or conference. Previously published or accepted conference papers must contain at least 30% new material to be considered for the special issue. All papers are to be submitted by referring to http://www.springer.com/799. At the beginning of the submission process, under “Article Type”, please select the appropriate special issue. All manuscripts must be prepared according to the journal publication guidelines which can also be found on the website provided above. Papers will be reviewed following the journal standard review process.